On December 18th, 2017, the Federal Motor Carrier Safety Administration (FMCSA) implemented a 2-year “Phased-In Compliance Phase” as part of their Electronic Logging Device – ELD Mandate Rule, first published February 16, 2016. Since then, law enforcement agencies have been following a relatively “Soft enforcement.” Violations have been categorized as 395.22(a) infractions without the assignment of CSA points or the issuance of out-of-service citations. There has been a fair amount of confusion in regards to the ELD rule for both truck operators and law enforcement alike, especially since AOBRDs are still grandfathered in through December 17, 2019. Beginning April 1st, 2018, the full enforcement of the ELD mandate rule will kick in with the associated CSA points and issuance of out-of-service citations when deemed appropriate. There are some areas where the “soft enforcement” approach is not being followed and law enforcement is moving forward with citations. In this case, when cited for non-compliance with the ELD mandate rule, drivers and carriers will be required to file the necessary documentation and provide adequate records. Fleets should support inspectors in determining what type of ELD they are utilizing to determine proper compliance. ELD’s allow for the real-time monitoring of a spectrum of data points pertaining to both truck fleets and truck drivers. ELDs monitor and report on driver behavior such as whether they are speeding, idling excessively or hard braking. ELD’s also now integrate mapping solutions that allow fleet managers to track routes and support drivers with navigation. They save time and money by reducing cumbersome and wasteful paperwork, they track driver hours electronically, they allow heightened dispatcher-to-driver communication and coordination, optimize load planning and they greatly reduce the obnoxious hassle of operating an antiquated paper log. As technology moves ever closer to wireless, electronic and digitized platforms, ELDs are most likely here to stay. The second phase of the mandate, the “Phased-In Compliance Phase,” states that carriers and drivers subject to the rule may usen AOBRDS that were installed prior to December 18, 2017 or Self-Certified and registered ELDs with FMCSA. 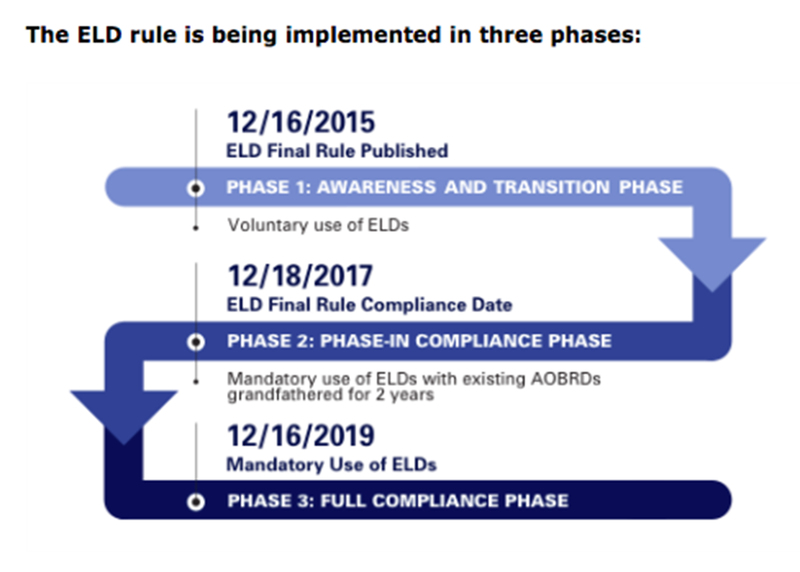 This 2nd phase will end December 16th, 2019 when full compliance with the mandate will be expected as part of the “Full Compliance Phase” to utilize self-certified ELD’s that are registered with FMCSA. In a wide range of industrial sectors, we’re here to protect and optimize the machines that keep our country moving, and we pride ourselves on providing superior logistics and solutions, extensive product and industry knowledge and total performance satisfaction for our customers. No matter where the future of the automotive industry is headed, we will be there to deliver what you need to keep you in motion. For information on how we can assist you in understanding and remaining in compliance with the December 18, 2018 ELD mandate, contact an SCL consultant today.